When Ensign John Yorktown reports aboard a destroyer in the Far East, he finds himself confronted by an unpopular war as well as the morass of 1960s society. Forced to conform, he makes life-altering decisions that impact the lives of the crew, the future of his ship, and the woman he loves. Having just graduated from the University of Texas, Ensign John Yorktown quickly learns that NROTC has not prepared him for either liberty call or the ethical questions raised by the Vietnam conflict. Boats, his mentor, is determined that John be transformed into a true China sailor as they journey from the bars of Thieves Ally in Japan, duel North Vietnamese shore batteries, and anchor in the port of Hong Kong where he meets the exotic bar hostess Firefly. 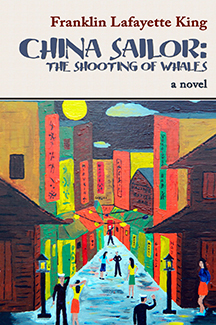 China Sailor is told with the humor and pathos of wartime sailors. Franklin Lafayette King, Jr., a combat veteran, served as an officer aboard a destroyer homeported in the Far East during the Vietnam conflict. The storyline of the book is taken from his journal written during a time of social change, undeclared war, and potential global conflict. In addition to China Sailor, he is the author of ten books that include both novels and works of poetry.